Mindful of the forthcoming Copenhagen meeting on climate change, the Pacific islands of Kiribati and Tuvalu are calling upon all nations to reduce their carbon emissions so that they might be able to stay in their countries and not be forced to relocate elsewhere. Over the past two years, Jesuit Refugee Service Australia, in collaboration with the University of NSW Psychiatry Research and Teaching Unit, has been investigating the psychosocial effects of displacement resulting from climate and other ecological changes in Pacific Island nations. When I visited Kiribati and Tuvalu in May 2009 I asked elders, policy makers and government workers about their five biggest personal fears for the future. Among the top concerns were prospects for their children and the economy, an uncertain future, cultural change and climate change. The people of Kiribati and Tuvalu, though faced with possible future displacement because of climate change, are also dealing with complex global stressors that are impacting on their lives today. Climate change is viewed as a significant factor that compounds the effects of these other stressors and some describe it as a tipping factor, one that will eventually make the other stressors unmanageable. It is obvious that both populations are dealing with overcrowding, unemployment, poverty, pollution, and modernisation. Climate change is a driver for some of these stressors as well as a multiplier of their effects. Significantly, people in both Kiribati and Tuvalu told me their concerns about climate change escalate when there is a severe climate event, a tsunami warning, a hurricane or a king tide in other vulnerable parts of the world. 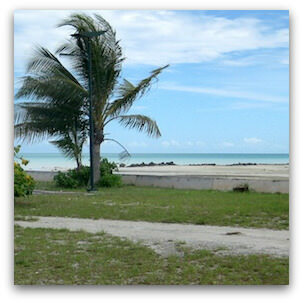 On Kiribati and Tuvalu there would simply be no place to run to. One has only to think of the devastation and fear caused by the recent tsunami in Samoa, America Samoa and Tonga to know that the people of the Pacific are grappling with a major global stressor over which they feel they have no influence. Both nations have different political discourses about climate change and its future prospects for the population. What does seem to be clear from these responses, however, is that each nation is facing multiple challenges and climate change is only one among many. The adults who were interviewed were very concerned about the future of their children and the opportunities that they might have in the future. They also recognised that their culture is changing and that one of the consequences of climate change may be the need for people to migrate. When Kiribati and Tuvalu students in Year 13 (the final year of secondary school) were asked to brainstorm and then rank the things that they worried about, their lists included rising sea-levels, unemployment, education, overcrowding, a change in culture, health concerns, development and an increase in the cost of food. Clearly these adolescent sample groups were very aware of the impact of climate change on their country, among the other difficulties currently being faced. What was most apparent from this research, and the accompanying interviews conducted with government officials and other stakeholders, was that both these nations believe they have a major role to play in advocating for nations to reduce their greenhouse gas emissions as a matter of urgency. They believe that they are presently experiencing the effects of climate change, effects that could result in their own countries becoming unviable unless drastic actions are taken by the world's political leaders. Dr Maryanne Loughry, a Sydney-based Sister of Mercy, is associate director of Jesuit Refugee Service Australia. She recently visited Bougainville and the Carteret Islands to collect further data on climate change displacement. Recent articles by Maryanne Loughry. When Martin Luther King said that if we did not work together to solve our problems, we would perish together as fools, he knew that the first to perish were those in the poorest circumstances. The people of Kiribati etc can see this clearly. Isn't it a pity that the facts behind the apparent sea level rise aren't included in this report. I wonder if Dr Loughry has considered the movement of sand bars and the effect of rising and falling land masses in assessing the cause of the reported sea level changes and, also, if there has actually been a change at all! The case of the Maldives where there has been a reported fall in sea level leaves a confusing message. Perhaps Dr Loughry might like in future articles to present some authorative evidence on actual sea level changes and demonstrate that they are caused by carbon dioxide to avoid her conclusions being questioned. There are so many 'victims' in this world seeking help that we may run out of victimizers to first deliver the required apology followed by the expected compensation! It is true that both tsunamis and climate change pose challenges for the people of the low lying islands. But let us not confuse the two. Tsunamis are NOT a manifestation of climate change. It is misleading, and even mischievous, to panic these people into thinking that the consequences of climate change will rise up in minutes and overwhelm them like a tsunami. I have heard numerous climate change alarmists claim tsunamis as an effect, but the claim only serves to undermine their credibility and to induce panic in the uninformed. There are enough serious consequences to consider without introducing false ones. When you tell us all that climate change is happening and affecting us adversely - we start to believe it. Media and interest groups use this to further exacerbate this belief. Five years ago no one was talking about climate change change here (Kiribati). It is sad that this sensationalism without balanced scientific explanations is creating 'panic' amongst us. Ever heard of shifting sands? In Tarawa lagoon, there is an islet that once was lush with palm trees and other vegetation but was eroded in a very short time period due to a series of causeways linking islets on the capital strip of land that caused a shift in sand movement. ABC News America hired a boat and brought a broken pandanus tree to this islet which has been bare for more than two decades, placed it on the beach and used this islet as an example of climate change and sea-level rise in action! It is unfortunate that our President is saying that we are sinking due to climate change - this message and image only potrays us as defeated. Atolls are becoming extremely vulnerable physically as the combination of increased extraction of water from the fragile fresh-water lens due to population increase and the increasing rate of sealevel rise means that the traditional wells have a limited life expectancy. Access to means to reduce infant mortality and to extend life expectancy have contributed to the rise in population density. Family planning could be dealing with the birth rate but probably Catholic teaching is still blind to the consequences of proscribing the most effective means of birth control. I understand that tsunamis normally do not impact on atolls as there is very little "shelf" for the wave to build up on.